Be the first to share your favorite memory, photo or story of Wynell. This memorial page is dedicated for family, friends and future generations to celebrate the life of their loved one. 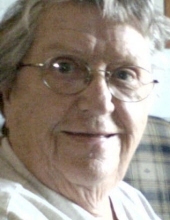 Mrs. Wynell Linzy Smith, age 94 died Sunday, April 14, 2019 at Serenity Place in Dublin, Georgia. A memorial service will be held Tuesday, April 16, 2019 at 2:00 P.M. in the Richard Stanley Memorial Chapel with Rev. Randy Adams officiating. Mrs. Smith was born February 9, 1925 and lived the past 33 years in Wrightsville after moving from Macon. She was the 1992 Johnson County Woman of the Year and worked as an office manager for a surgeon. Mrs. Smith was preceded in death by her husband William Thomas Smith, Jr. and by her parents, Jack Linzy and Clyde Floyd. Mrs. Smith is survived by daughter Nancie Smith and by daughter-in-law Vicki Miller, both of New Orleans, Louisiana. To send flowers or a remembrance gift to the family of Wynell Linzy Smith, please visit our Tribute Store. "Email Address" would like to share the life celebration of Wynell Linzy Smith. Click on the "link" to go to share a favorite memory or leave a condolence message for the family.